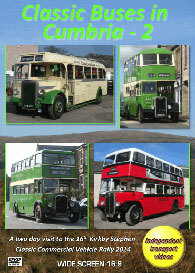 Following on from the success of our DVD release of the 2011 event the independent transport videos cameras have returned in 2014 to record this superb 16th Kirkby Stephen Classic Commercial Vehicle Rally. With the usual supply of AEC Regals and Regents, Leyland Titans and Atlanteans, Daimler Fleetlines, a Bristol K type and Lodekkas, Guy Arabs, both single and double decks, this programme will not disappoint! Filmed over the Easter weekend the weather was kind to us on both days offering sunshine and blue skies in this beautiful part of Cumbria. Our filming starts early on Saturday morning at the Rally site at Brough where the buses are arriving and starting to take up their duties for the day. We join former Darlington Corporation 4 (304 VHN) a Daimler CCG5 with Roe bodywork and set off for the busy Market Street in Kirkby Stephen. Here we record the buses in action as they mingle with preserved lorries, vans, miniature steam engines and the traffic in this delightful town. On our return to Brough our cameras record the buses and coaches along the A685, New Road, Main Street and at the rally site before we board former Blackpool Transport 133 (H3 FBT) a DAF Optare Delta for a ride to the Kirkby Stephen East railway station. Further Kirkby Stephen locations are along South Street, Victoria Square and Market Street. Our next journey takes place on Bamber Bridge Motor Services number 4 (UTC 672) an AEC Regent III with East Lancs bodywork to Kirkby Stephen West railway station. We then return to Brough on board former Barrow Corporation 104 (LEO 734V) a Leyland Atlantean AN68 with bodywork by Northern Counties. With more filming at Brough New Road and Main Street we record some of the vehicles running on the Saturday evening road run from our vantage point along the A685 by the West station. Filming then resumes early on Sunday morning from the rally site on board South Shields Busways Leyland Atlantean AN68/2, 268 (SCN 268S) with a panoramic window body by Alexander. Alighting from the bus just outside Kirkby Stephen we film the buses passing along the A685, before filming in the town on North Road and Market Street. It is here that we ride out again to the West station, this time on board former Blackpool Corporation 501 (HFR 501E), a Leyland Titan PD3A with MCW body. Another chance to see the splendid countryside from both the bus and at our destination. More filming is done at Brough and Kirkby Stephen, and it is from Market Street that we join our last ride on this programme. It is on former New World First Bus of Hong Kong DA5. Now reregistered G303 FWC and operated by Stagecarriage of Tees Valley, we enjoy a spirited run back to the Brough rally site to see the conclusion of what has been two spectacular days. Our thanks go to the organisers of this brilliant event. If you were not there, you can now see what you have missed!